There’s no doubt about it. It only took one bite and Anita and I both agreed: a deviled egg salad club sandwich is a fantastic thing. 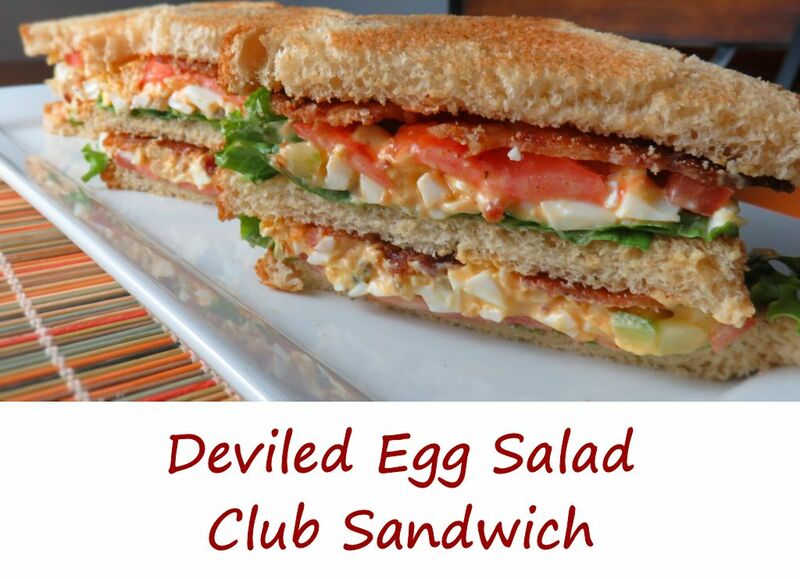 It is the combination of two classics, deviled eggs and a club sandwich. Crunchy bacon, creamy egg salad and fresh juicy tomato. Nothing fancy, but something mighty good. Perfect for a picnic or outing, too, since you can make all of the components ahead of time and just assemble the sandwiches at the park or wherever you’re going! We recently received an egg cooker as a gift. I was highly skeptical of it. I’ve had limited success with kitchen gadgets. Well, I admit when I’m wrong because the cooker makes the absolute perfect hard-boiled eggs (among other ways of cooking eggs) for a deviled egg salad sandwich and everything else. I cannot for the life of me get it to make a bad egg. They peel easily and without any damage to the eggs time and time again. It never fails. I absolutely love it. For a totally different egg salad, use smoked eggs instead or make my copycat of Denny’s club sandwich. Or skip the bread and make my deviled egg salad. Combine the eggs, mayonnaise, onion, sweet pickle relish, paprika, salt and pepper to taste in a bowl. Using the back of a fork gently mash the eggs while stirring. Place a piece of lettuce and a slice of bacon onto 4 slices of the bread. Top the bread lettuce and bacon with 1/2 of the egg salad mixture. Add another slice of bread to each sandwich and top that slice with more lettuce and bacon, followed by the rest of the egg salad. Top each sandwich with the last slice of bread and serve. This entry was posted in Main Dishes and tagged Deviled Egg Salad, Deviled Egg Salad Club Sandwich, recipe by Mike. Bookmark the permalink.